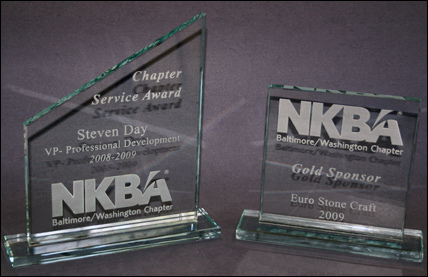 Classic Glass recently created 17 awards for the National Kitchen and Bath Association, Baltimore-Washington Chapter. The etched glass awards were presented at the NKBA, BWC annual holiday social. They were given to the 2009 sponsors in recognition of their generosity and support as well as officers/committee members for their dedication to the chapter. Etched glass is an elegant, cost effective product that can be customized for glassware such as bowls, wine glasses and vases. This entry was posted on Wednesday, December 9th, 2009 at 9:05 am	and is filed under Decorative Glass. You can follow any responses to this entry through the RSS 2.0 feed.Both comments and pings are currently closed.